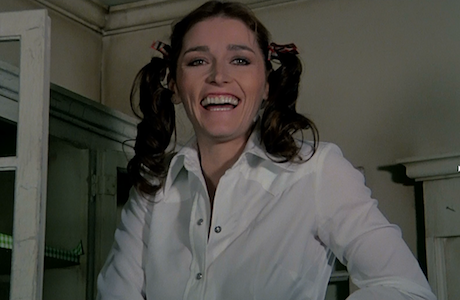 When asked what attracted her to The Amityville Horror on the interview supplements included with this three-disc Blu-Ray set, Margot Kidder points out that it was the paycheque. She'd just done Superman, which was her passion project, and took on the role of Kathy Lutz merely as a paid transition until another role of interest came up. James Brolin (who plays her husband in the film) says the same thing in a more politically conscious, polite way, pointing out that he was making the transition from commercials to film and took what was thrown at him. Both of them acknowledge that working together — having an extremely different approach to acting — was absolute hell. It's because of this, and the fact that The Amityville Horror was ostensibly just a studio adaptation of a populist book rooted in conservative fear-mongering, that the mediocrity and overall competence are a bit of a surprise. The core story, which revolves around an ersatz Brady Bunch union of a remarried couple with respective kids, is, as is the standard for the haunted house genre, a horror about the changing status of the family. Kathy and George Lutz buy a house that's way outside of their price range and immediately start to suffer marital tensions. He's stressed about finances and the prospect of raising the children of another man, while she's mostly reactive, trying to subdue his increasingly erratic behaviour, when not showing a bit of independence by fighting back. The initial peculiarities occurring in the house — people of the cloth and anyone spiritual are immediately nauseated when they approach, while smells, drafts and the occasional closing window raise eyebrows — gradually escalate as George's emotional disposition unfurls. As framed by Cool Hand Luke director Stuart Rosenberg, there's often an effective building of tension whenever something is about to go awry. This helps the visceral component compensate for much of the broadness in storytelling and the transparent religious iconography, suggesting that a family removed from the tenets of God is helping unleash evil and moral disarray. There are even a few genuine scares that remain effective to this day, making this original version of this bogus "true story" hold up better than the remake with Ryan Reynolds and Melissa George. The same can't be said for the sequel, Amityville II: The Possession, which takes the '80s preoccupation with the death of traditionalist values to a new level. Presented as a prequel, it follows the experiences of Anthony (Burt Young) and Dolores Montelli (Rutanya Alda) after they move into the haunted family abode. The dysfunction is evident from the outset, with Anthony whipping his kid with a belt and slapping around his wife without batting an eyelash. Again, his refusal to embrace God, responding angrily when his wife attempts to have the house blessed, mirrors the implicit horror of a modern society living Godless lives full of divorce, homosexuality and an indifference towards tradition. Taking it a step further, the eldest son (Jack Magner) becomes possessed by a demon — something their Godlessness surely let in — and then proceeds to develop physical mutations, coercing his younger sister (Diane Franklin) into sexual acts. The simultaneous salacious indulgence in such familial perversion blended with the overall conservative attitude of Amityville II makes for a muddled subtext that contradicts itself. Writer Tommy Lee Wallace (who also did Halloween III, a film that stepped away from the series mythology to throw some jabs at consumer culture) says that he hated the original Amityville Horror and was far more interested in exploring what might cause someone to kill their entire family. His shallow interpretation of domestic violence doesn't sell the idea particularly well, just as the clumsy integration of spookiness — there's absolutely no build up or subtlety when windows start slamming and faucets start pouring blood — leaves much to be desired in a popcorn entertainment capacity. Instead, the story rushes through a possession to reiterate an admonitory about faith when the third act turns into a protracted exorcism. The moral ambiguity and childish impropriety of this second film are far more intriguing than Amityville: 3D, however. This time out, the idea of debunking a phenomenon (the story of the Amityville haunting was widely known as a hoax by this time) drives the story forward, when a sceptic buys the house and resultantly endangers his daughter (Lori Laughlin). It's an extremely unfocused and dry effort that relies on external scares (a car accident and elevator mishap) to drum up tension. Worse is that the 3D is overly cheesy (Frisbees thrown towards the camera and objects jutting out of the frame stand out as particularly groan-inducing), having a blurry, disorienting effect on the home 3D television, likely due to age and conversion issues.